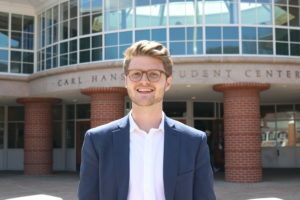 Junior political science major Austin Calvo has been elected President of the Student Government Association for the 2019-20 academic year. Calvo, the current Vice President of Student Experience, ran on a campaign of student advocacy and calls for both administration and SGA to be more transparent with the general student population. Calvo defeated current Vice President Luke Ahearn, a junior marketing major, by 564 votes. However, the election was anything but contentious. The two were both at the SGA suite as the results rolled in and were talking most of the night. As they waited for results, both described feeling relieved that the entire thing was over. Ahearn has been public about wanting to continue to work with Calvo and SGA. He will be on SGA as a senior class senator and has no plans to abandon the objectives and promises he ran on. Calvo ran his campaign on making SGA accessible and transparent. In contrast, Ahearn focused on enhancing student experience, with an emphasis on bringing back a university-recognized May Weekend festivities. In an effort to meet his promise, Calvo spent the campaign season going to dorms and talking to students. He carried a notebook with him and within its pages, he wrote down the complaints he heard. Calvo says he plans to give the book to President Olian at their first meeting for her to keep. Joining Calvo will be a new executive board including Vice President Sophia Marshall, a sophomore ELPMA major; Vice President for Student Experience Esau Greene, a sophomore political science and sociology double major; Vice President for Marketing and Public Relations Jamien Jean-Baptiste, a sophomore behavioral neuroscience major; Vice President for Finance Glenn Adams, a sophomore 3+1 business management major and Lille Gaeta, a sophomore political science major, who will become the second chief justice of SGA’s judicial board. The new board will be more diverse than in years past. The new board includes two people of color and two people who identify as members of the LGBTQ community. Calvo believes this board will help SGA connect more effectively with the entire student population. A major theme in all races was SGA approachability. A majority of candidates and most of the winners cited it as an issue important to them in their ‘meet the candidate’ pieces. All the candidates detailed a variety of ways that they planned to make SGA more accessible and present in the daily life of the student population. Calvo took responsibility for the lack of SGA presence at student events this year while he was Vice President of Student Experience. This year’s government faces a unique situation. Olian has unveiled her strategic plan for the university and has signaled a desire to work closely with student government. Current SGA President Ryan Hicks has stated that SGA has a tentative date of April 24 to meet with Vice President and Provost Mark Thompson to discuss the budget of President Olian’s strategic plan. Austin Calvo and the new SGA will be sworn in on Wednesday, April 17 following their yearly budget meeting.